Employee benefits are one of the biggest expenses employers have—with health care costs topping the category. Many employers are forced to respond by pushing more costs to the employees. However, increasing employee contributions too much can hurt a company’s ability to attract talent. Therefore, they must strike a careful balance. 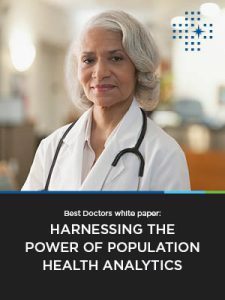 Population analytics is one solution to help employers manage health care costs, especially for self-insured employers who take on more risk. Health professionals have already started taking advantage of the data from EMRs and claims, but the use of big data by employers is less common. Though, the benefits of employers using population analytics to identify high-cost claims are considerable. Half of health care expenses are incurred by only about 5 percent of a population. Understanding who that 5 percent makes it possible to look into why claim costs are so high and intervene, which can save employers in the long run. For most of those employees, an incorrect or delayed diagnosis and treatment are often the cause. Best Doctors, which provides expert second opinions for complex medical cases, corrects 45 percent diagnoses and 75 percent of treatments of our members’ cases. Identifying employees with multiple emergency room visits who may not be managing their conditions well, despite the high visit costs. Identifying employees with commonly misdiagnosed conditions or conditions with multiple treatment options, like cancer, musculoskeletal disorders and cardiovascular disorders, and encouraging them to get a second opinion to ensure the correct next steps. Identifying employees with chronic conditions and clinically integrating with other vendors, such as disease management services, to ensure proper management. Using population insights to determine the most effective uses of benefits funds in the wake of rising health care costs. For many reasons, such as ensuring employee privacy and lack of in-house expertise, employers often use vendors to analyze data. The clinical data analysts develop algorithms that sort data, and then are vital in interpreting the results. Once health data have been analyzed, employee outreach is perhaps the most important step—which is why partnering with a vendor that can provide the analysis as well as outreach and engagement is so important. Ultimately, focusing on and assisting the individual employees will positively impact outcomes and spending.